The Afghanistan Business Innovative Fund (ABIF) supports innovative businesses, to help boost income and employments in Afghanistan. At present, the carpentry industry in Kabul is quite limited. Most shops only have basic tools, which means they can only produce basic products like doors, window frames and bookshelves. As a result many businesses import their furniture from abroad, which in turn damages the livelihood of the carpentry business in Afghanistan. Sayed Walid noticed this problem and decided to start his small business ‘Naab Interiors’ in 2012 with support from the Afghanistan Business Innovation Fund (ABIF). The purpose of Naab Interiors was to introduce advanced technology into the carpentry sector to support the local carpentry trade to compete against imports. One special feature of Sayed Walid’s business was to use computer technology in carpentry. This technology allows carpenters to create products which are better quality, in-demand and that can sell for higher prices. Craftsmen can also use Naab Interiors’ services to significantly reduce their labour costs, while still ending up with beautiful hand-carved pieces for the higher-end market. Most Afghan woodworkers don’t know about computer-aided design and manufacturing, but Naab Interiors is helping them by providing training on high-tech production and design, which makes them more efficient and helps them earn better incomes. 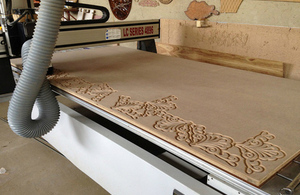 Naab recently added a new laser engraving machine to expand their value-adding services, further showing how ingenuity and new technology can help solve development challenges in Afghanistan through the private sector. Whilst helping local carpenters become more competitive, Naab Interiors is also becoming a very successful business. Naab Interiors has received support from the Afghanistan Business Innovation Fund (ABIF) which is funded by UKaid.